“Age of Death” takes a modern approach to the game’s Stone Age backdrop. The Far Cry Primal TV spot follows the lead character as he continually defies deadly circumstances when encountering threats like woolly mammoths, sabretooth tigers, and prehistoric tribes. 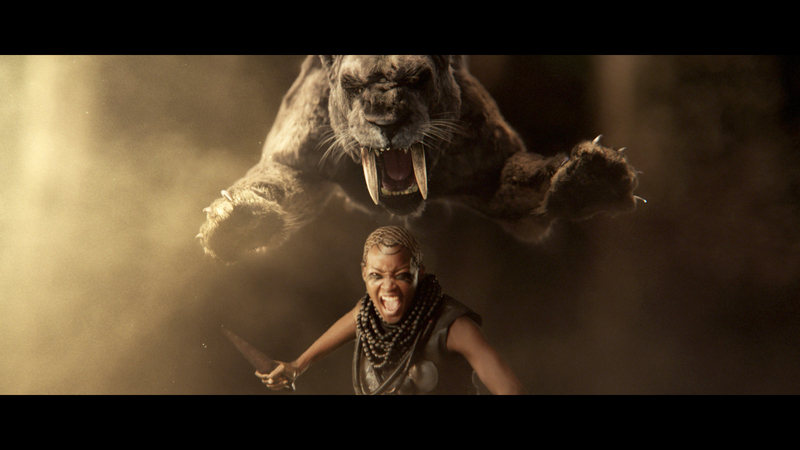 To celebrate the highly anticipated release of Far Cry Primal, Ubisoft worked with Omelet (http://www.omeletla.com) – the LA-based creative shop – to create “Age of Death,” a live-action broadcast spot that brings fans into the game’s Stone Age backdrop. In it, fans follow the lead character as he continually defies deadly circumstances when encountering threats like woolly mammoths, sabretooth tigers, and prehistoric tribes. Fans can see the official live-action Far Cry Primal spot on YouTube and major television networks. Directed by Patrick Clair, an Emmy-winning director who is well-known for creating the memorable opening sequences on shows like True Detective and The Man in the High Castle, the commercial deftly brings live action into a CG world to recreate the prehistoric thrill that fans are anticipating. An exclusive director’s cut of the live-action Far Cry Primal TV spot is also available for fans. The release comes on the heels of Omelet’s first campaign with Ubisoft and the reveal of the Tom Clancy’s Rainbow Six® Siege theatrical trailer starring Idris Elba. Omelet is a creative company that solves complex marketing problems for progressive partners, including AT&T, HBO, Microsoft, Ubisoft, and Walmart. The company also has divisions – including Omelet Studio and Omelet Brands – to create original brand programming and original owned intellectual property. Ubisoft is a leading creator, publisher and distributor of interactive entertainment and services, with a rich portfolio of world-renowned brands, including Assassin’s Creed, Just Dance, Tom Clancy’s video game series, Rayman, Far Cry and Watch Dogs. The teams throughout Ubisoft’s worldwide network of studios and business offices are committed to delivering original and memorable gaming experiences across all popular platforms, including consoles, mobile phones, tablets and PCs. For the 2014–15 fiscal year Ubisoft generated sales of €1,464 million. To learn more, please visit http://www.ubisoftgroup.com. © 2015 Ubisoft Entertainment. All Rights Reserved. Far Cry, Ubisoft and the Ubisoft logo are trademarks of Ubisoft Entertainment in the US and/or other countries. Based on Crytek’s original Far Cry directed by Cevat Yerli. © 2015 Ubisoft Entertainment. All Rights Reserved. Tom Clancy’s, Rainbow Six, the Soldier Icon, Ubisoft, and the Ubisoft logo are trademarks of Ubisoft Entertainment in the US and/or other countries. Fans can see the live-action Far Cry Primal spot on YouTube and major television networks. Omelet is a Los Angeles-based creative company.